I created Baby Sign and Learn to help parents experience the joy of discovering what their babies have to say before they can talk. While learning to sign with with my daughter, I found most of the baby sign products on the market were aimed strictly at the parents. 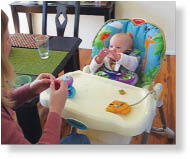 I thought a better approach might be for parents and babies to learn together in a playful and relaxed way. With this in mind, I created the Baby Sign and Learn range of products aimed at teaching through play. As I have a background in computing and technology, Baby Sign and Learn also provides me with an avenue to express my creativity and exercise my technical skills while I'm at home looking after my daughter. If you have any signing stories you'd like to share please contact me, I'd love to hear them! Best of luck on your own signing journey, I hope you find it just as rewarding as I have.